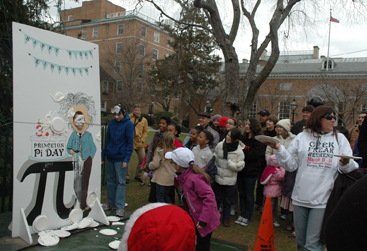 PIE ON THE FACE, PI ON THE BRAIN: Pie throwing on the green at Palmer Square was among the festivities taking place on Geek Freak Weekend celebrating all things math and science in Princeton, as well as the birthday of former Mercer Street resident Albert Einstein, who was born on March 14, or Pi Day, since the numerals can be written as 3.14. Einstein look-alike contests, Pi recitation challenges, math competitions, and merchant discounts were all part of the weekend celebration. Sustainable Princeton wants you to bring your own bag while shopping. Aiming to reduce plastic waste, the organization is launching a campaign to promote reusable bags and to reduce the demand for single-use plastic bags. Most of us who live in the United States simply take for granted the plentiful references to God, said Emmanuel College Principal Mark Toulouse in his opening remarks at the recent Institute for Faith and Public Lifes Turn the World Upside Down, a three-day program sponsored by the Princeton Theological Seminarys (PTS) School of Christian Vocation and Mission. Im delighted to do it for them, said Becoming Jane Eyre author Sheila Kohler of her upcoming reading at a People & Stories/Gente y Cuentos benefit on Friday, April 1, at 7:30 p.m. at The Nassau Club.